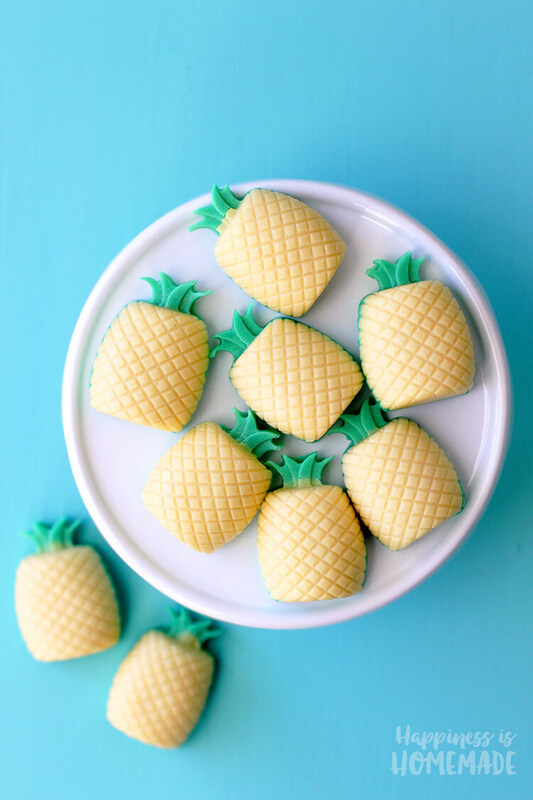 These DIY Piña Colada Mini Pineapple Soaps are the perfect way to keep your skin refreshed and ready to show off! Pineapple + coconut are a delicious tropical combination that smells incredible! 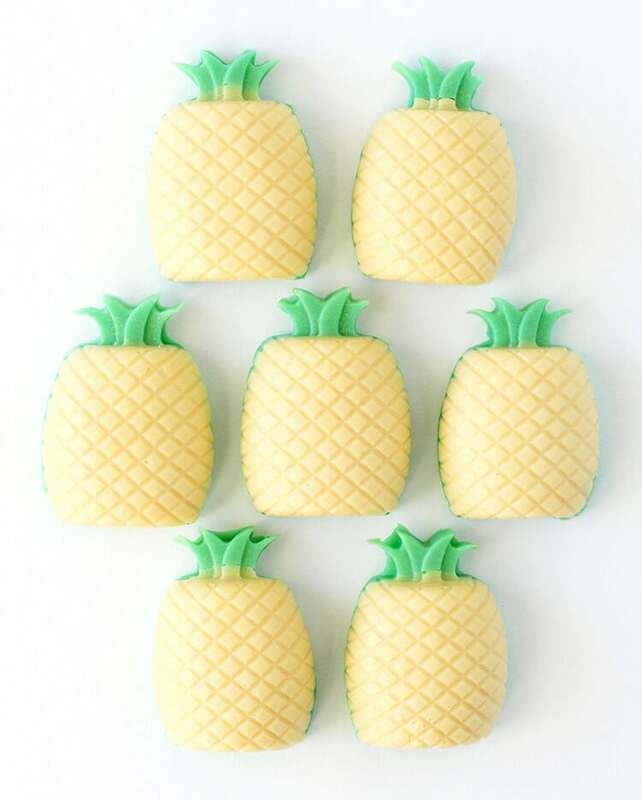 While I making piña colada sugar scrub, and I already had the pineapple fragrance oil out, I whipped up a quick batch of these adorable mini pineapple soaps. They make a great gift idea and take just a few minutes and a couple of ingredients to make! I didn’t take any step-by-step photos of the process this time, but don’t worry – it’s super easy! If you want more in-depth detailed instructions on how to make melt & pour soaps, check out our DIY Pumpkin Spice Soap post! For these mini pineapple soaps, I used about 1/2 lb. of the soap base in a Pyrex measuring cup, and added 5 drops of pineapple fragrance and 1 block of gold soap colorant. I filled the pineapple molds 2/3 of the way full with gold soap (there will still be soap leftover in the measuring cup), and allowed it to cool. I took the remaining gold soap in the measuring cup and melted it again, adding lime green colorant to the gold, and filled the remaining 1/3 of each pineapple mold. Allow to cool completely before removing soap from molds. Easy peasy, and SUPER cute! It’s hard to tell in these photos, but the pineapples are actually really shimmery and sparkly! If you love this idea, don’t forget to pin it! I went to order the ingredients for the pineapple soap, and I had a question. The instructions call for metallic gold for the body of the pineapple, but in your photos it’s a pale yellow. Could you let me know if there is another color I should get for this project? Where can I get the Pineapple molds at & how much are they? You can find them here on Amazon: CLICK HERE! These are so fun! How many pineapples does this recipe make? One mold’s worth?